You know... I really can't think of anything else that is turquoise. I mean, you can always make things turquoise, but then this list would be endless. When you think about it, very few things actually show up in nature that are the color of turquoise (besides the turquoise-browed Motmot, of course). Can you think of anything? Leave your ideas in the comments area below! 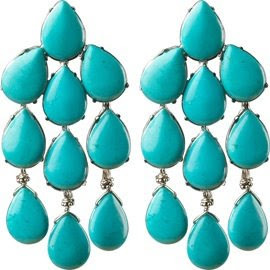 The stone turquoise, which I think is where the color name comes from? The sky on just the right kind of day.....I always vowed to make myself a dress out of fabric the color of the sky. I saw some fish in the National Aquarium over the weekend that were turquoise. And translucent turquoise at that. Very cool.